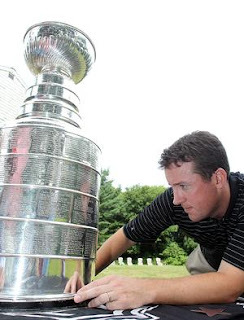 Reports in The Boston Hockey Blog (BHB) and U.S. Hockey Report have confirmed what has been rumored in hockey circles for the past several weeks: former Terrier forward Steve Greeley has been named an assistant coach on David Quinn’s staff, filling the slot left open when Associate Head Coach Mike Bavis departed. A 32-year old Scituate, Mass., native, Greeley, who has been a pro scout for the Los Angeles Kings, played for BU from 2000 to 2004, followed by a season in the ECHL. It is expected that BU will officially announce Greeley’s appointment next week, following Sunday’s NHL draft, Greeley told the Boston Hockey Blog that he’ll fly to Buffalo on Monday to scout USA Hockey’s Select 17 Development camp, where two current BU recruits, JJ Piccinich (2014) and Robert Carpenter (2015) will be in action. “As soon as I knew this was an opportunity, I knew in one night it was what I wanted to do. I think there’s something to be said for working with a college, and to BU is a pretty special place. I’ve made some great friendships here, and I want to be a part of it again." Greeley, who will play an important role in recruiting for BU, spent seven seasons with the King, first as an amateur scout and more recently as a pro scout. He discussed his role with the Kings in a 2010 NHL.com interview , and, last July, after the Kings won their first NHL Championship, he brought the Stanley Cup home to Scituate for a day. (Photo credit: Robin Chan, GateHouse News Service). Greeley’s resume also includes experience scouting the type of talent he’ll be seeking for the Terriers. Between 2009 and 2012, he served as Eastern Regional Scout for USA Hockey’s National Team Development Program (NTDP). Earlier, he was a coach for Massachusetts Hockey during tryouts for USA National Festivals in 2006 and 2007. He also had a stint as assistant coach at Thayer Academy, where he had been a standout forward and served as captain in 1999-200. Before joining the BU coaching staff, he was one of three former Terriers on the Kings’ scouting staff, along with 2003-04 captain Mark Mullen and Bob Crocker, the Dean of New England Hockey Scouts. ►Last weekend, the Third Annual Boston Whiffle Ball Challenge, benefiting the TravisRoy Foundation and the Franciscan Hospital for Children, was held at BU’s Nickerson field with the Terrier hockey team earning top spot in the competition.